To refresh: Hillary Clinton’s campaign gave Fusion GPS millions of dollars to help trash Donald Trump. Fusion GPS hired former MI-6 agent Christopher Steele to put together a dossier on Trump’s alleged Russian connections. “Dossier” is a French word that, in this case means “salacious and unverified.” Steele collated a bunch of tidbits and tales from Russian sources and Putin agents. At some point, this Hillary Clinton work product ended up in the hands of the FBI. And that’s where the tale takes an ominous turn. But before we get into the gritty, a quick get-well shout out to California’s longtime Democratic Senator Dianne Feinstein. She’s got a bad cold. Or at least that’s what she’s saying to explain why she ignored an agreement with Republican Sen. Chuck Grassley not to release testimony transcripts and dumped on the world the full August testimony of Fusion GPS co-founder Glenn Simpson. 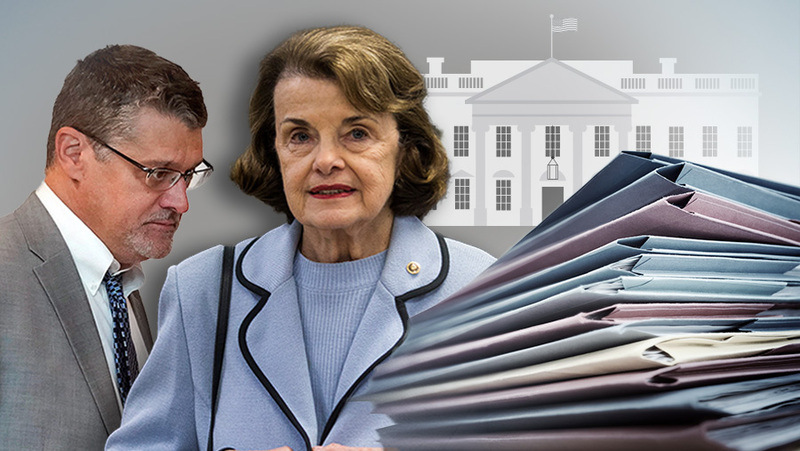 Sen. Feinstein was not at her finest Wednesday. She has released the transcript Tuesday. On Wednesday she said she had been “pressured” to release the transcript. “Pressured by who,” CNN asked. Then she denied being pressured. Then came her regret for releasing the transcript without consulting Sen. Grassley and blaming it on the stuffy sniffles. Maybe someday we’ll learn the truth of what really went on. Did she release it to get ahead of more damning info on the dossier? Did she do it to obstruct others from coming forward out of fear their testimony would be released to the world? Did she do it to give upcoming friendly witnesses a head’s up on Simpson’s testimony to avoid contradictions? Simpson’s testimony wasn’t under oath. Simpson did not independently verify any of the claims made by Steele in the dossier. What Simpson didn’t say was that his client was Hillary Clinton and the DNC. He also did not mention he had hired Nellie Ohr — the wife of a top DOJ official — to work on the project. It’s a family affair. Even his own wife Mary B. Jacoby — who, according to Conservative Treehouse has a history of Russia and Trump reporting — just happened to visit the White House right as Fusion GPS was beginning its Russia effort. Reading the dossier, you’d think Steele had Trump nailed down cold. As Andrew McCarthy reported, “Steele asserted the Trump campaign was engaged in a corrupt scheme with the Putin regime. … that the Trump campaign was actively complicit in Russian hacking of the Democrats.” And that the Russians had set Trump up for blackmail via hotel antics with Russian hookers. However, when push came to shove, Steele admitted he had nothing nailed down. Or glued. Or taped down. Or weighed down by copies of What Happened. When Steele was sued for libel over the dossier and had to give a deposition under oath, he backpedaled fast. Rowan Scarborough details the backpedaling here. Suddenly the information wasn’t of “huge significance.” It was merely “raw intelligence.” It was “unverified.” Steele just passed it along to the government for them to verify. McCarthy has an excellent new rundown of how Steele and Simpson used “smoke and mirrors” to sell their Trump Russia narrative. As Scarborough notes, Steele boasted to Mother Jones that he had ignited the Mueller investigation by convincing FBI agents in 2016 about the credibility of the dossier. What this means, in short: Hillary Clinton oppo research was used by Obama Justice Department to justify spying on the Trump campaign. So last summer this Steele dossier was sitting at the FBI: Hillary Clinton opposition research. “Salacious and unverified,” James Comey called it. You’d think the FBI and Obama DOJ would dismiss it, or perhaps keep it around for some light bathroom reading. Instead, they weaponized it. On Wednesday, Sara Carter confirmed what had long been suspected. The dossier was sold to a FISA court as viable intelligence and used to obtain a FISA warrant for surveillance on Trump campaign figures. But IG Horowitz is set to get the last laugh. His year-long investigation into the various FBI/DOJ antics to protect Hillary Clinton and sabotage Donald Trump is expected to conclude any time now. And it’s just the beginning. It makes sense to indict Clinton in or about August or September…the start of election season. The real reasons – of course – are ugly ones. Senator Grassley will know them. These guys put Nixon & his co- conspirators to shame. By comparison Watergate was the work of ametuers . On the upside however for Hillary, she can release an updated version of her literary comedic tour de force “What Happened “. I’d suggest a title, S**t Happened “ …!